Mary Leaming said that she had relatively difficult time to secure a small loan to pay for a parcel of land in Unity and an Amish-built tiny house. She finally was able to get financing through a credit union and now her new home is nearly complete. If adopted, a proposed appendix to the Maine Uniform Building and Energy Code is going to make it easier for anyone looking to make a tiny home their permanent address. Gov. 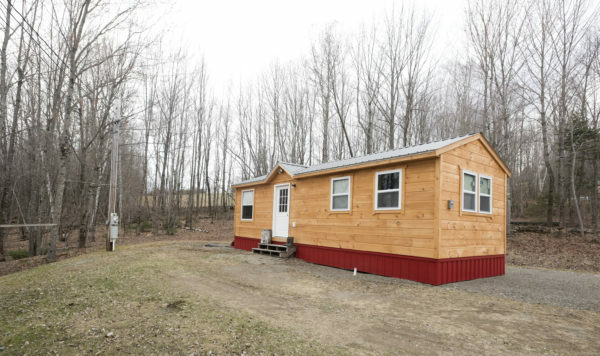 Paul LePage has already signed off on the proposed tiny house additions and the Maine Uniform Building and Energy Code Board will hold a public hearing on the proposed appendix next month. There is no unified building code or legal definition of a “tiny house,” but a residential structure under 500 square feet is generally accepted to be a tiny home, according to various online groups advocating the simplified lifestyle. And while there are no official numbers for how many tiny houses there are in the state, Berry said the simplified lifestyle is here to stay. Changes to Maine’s building code, he said, is only going to help the trend continue. Municipalities in Maine are free to use the state code as it is written, or use it as a base to which they add their own rules. The proposed appendix to the existing state code covers tiny house sleeping lofts, stairs, ladders and emergency escapes. Assuming the state board gives the proposed appendix the nod, Plummer said local building code enforcers will have something concrete upon which to base any decision when it comes to tiny houses. Without those state rules, Plummer said, some local building code officials were hesitant to issue permits for tiny houses. The language of the appendix, Berry said, is simply reflecting the reality of tiny home living. The Maine Uniform Building and Energy Code Board public hearing on the proposed appendix is 9 a.m., Sept. 18, at the Maine Department of Safety building on 45 Commercial Drive in Augusta.